Stylish and dependable this long knitted white cardigan by Karin is a wardrobe staple. 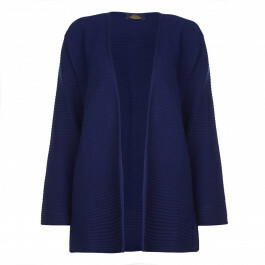 Perfect for work or leisure – it’s a useful layering piece whatever the weather. Sizing help: Size 1 = UK size 18, Size 2 = 20, Size 3 = UK size 22, Size 4 = UK size 24, 5 = UK size 26, 6 = UK size 28. White horizontal rib stripe cardigan. 50% Cotton 50% Acrylic. Delicate Machine Wash at 30 Degrees. Model’s height is 180cm (5ft 11in), wearing a size 1. For more information please call customer services on +44 (0) 208 455 0005 or one of our stores.